One of the greatest unknowns we had entering the modern era was just how technology would affect our daily lives. A plethora of 90s films such as The Lawnmower Man, Terminator 2: Judgement Day, and Hackers all painted wild depictions of what technology would look like and how things would evolve. Completely normal 90s folks becoming encroached by the world of the Internet spanned everything from “high tech interweb-crime” to “I have become the Internet” to “Holy crap, how did the machines get the launch codes?!”. 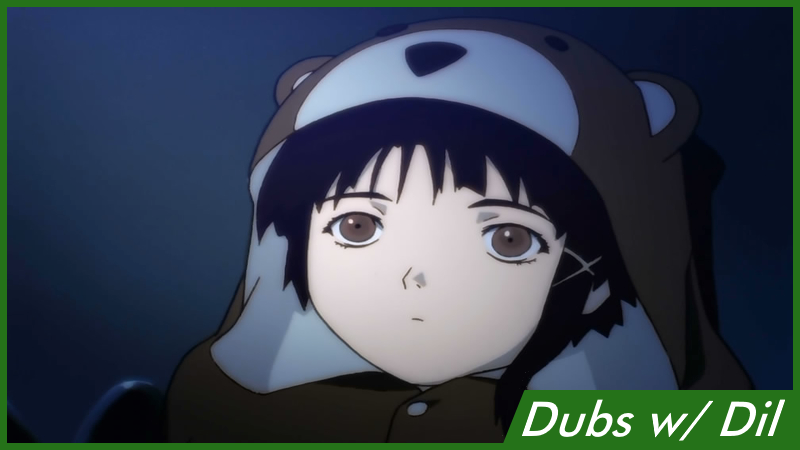 Anime had its own share of this world- most notably in the 1998 drama/mystery mind mashing series Serial Experiments Lain. Please read this for information regarding changes to the Dubs w/ Dil formatting before commenting on anything related to it, thank you. Dubbing in the late 90s still amazes me with how difficult the process looked doing ADR (automated dialogue replacement)- there certainly was software to help do it, but even the top of the line studio equipment gave mixed results. A lot of foreign language works that were dubbed over abandoned the cause for reaching an accurate lip syncing and stuck with the infamous result many call “Godzilla dubbing”. I think that with anime there was a little bit more of a professional pride than monster and kung-fu movies, but there was still a 50% chance that the finished work would either sound awful or look outright unfinished. Voice directed by Lia Sargent (Trigun, The Big O, Perfect Blue), the 1999 dubbing of Serial Experiments Lain appears to have had a solid outing. It isn’t a very easy show to contain in a dub, but I think there were creative liberties taken that fit the cadence of the wild visuals and feverish narrative. As with most careers early on, the cast might not have jumped out as memorable in name, but it doesn’t feel fair for someone to give analysis based off of lack of name recognition alone. Sargent, for example, took roles in a lot of pivotal 90s anime and lit up JRPG dubbing early in the PS2 era. Kirk Thornton is definitely a veteran in the scene- everything as early as Digimon and as recent as Persona 5. This series in particular really likes to use walla (the use of impersonating murmurs in the crowds)- if you’ve ever played a JRPG in a school setting (we can use Persona 5 for example) the sounds of students talking at an assembly or the people in the streets would be considered walla. Most of the time this is the cast exploring their range and gawking in very out there voices, however completely different voice actors can be brought in to perform. When Lain isn’t speaking to her family or friends awkwardly, walla is being used almost exclusively. Certainly something worth noting in a dub! The biggest performance in the series, however, had to be Bridget Hoffman (Irisviel von Einzbern in Fate/Zero) as the titular character, Lain Iwakura. Lain is a unique character to voice for a multitude of reasons, and coupled with the challenges of the time, I could only imagine the degree of difficulty such a character would pose on anyone. From start to finish, most of the story revolves around Lain transitioning from introverted schoolgirl to...whatever you want to call what happens to her in the end. She is a very quiet girl, so she doesn’t chat up a storm or anything of that sort, but there is a presence she has in progressing the plot of the series that poses problems. Before anything can happen, she has to fumble around her awkwardly quiet parents and (eventually) a mumbling sister. In these kind of scenes, the expression “less is more” actually has a lot of merit. I was impressed with how natural these parts felt, painting pictures of familial issues and less of pure silence (the little “uhm” and “h-hey” bits go far). Once she starts experimenting with drugs the Internet, two whole new independent characters for Lain are shown. There is a version of her who, like everyone behind a keyboard, is tough as nails. Assertive and demanding, she shakes down people for information and the deep, dark secrets of the 1998 cyberspace. The other personality is a wild and rebellious Lain who lives for exposing secrets and just being a general bad person. As with the Internet thug persona of the typically stoic girl, this voice feels a lot different from the other versions of Lain just from the omnipresent sarcastic tone and sneering given in delivery. These multiple personalities that Lain takes on throughout Serial Experiments actually has a fascinating background in the original language it aired in. Kaori Shimizu, the Japanese VA for Lain, worked with writers of the series (notably Chiaki Konaka) to change of orthographic structure of the script to better understand and prepare for the shift in role. It isn’t uncommon for a voice actor to take different characters in a work, but usually they have noticeable differences. To give credit due to Shimizu and Hoffman, they both had to give three very different voiceovers for the same character technically. Not to spoil anything, but there is a scene where the tough personality Lain choked out the rebel Lain as they exchanged lines passionately. An untrained ear would legitimately think these were not the same actress. Such dedication to getting it right in a bizarre visual is a fierce success. Bridget Hoffman’s two very different voices she uses here makes a fantastic conflict. Serial Experiments Lain was not a perfect show, and most of the people I’ve spoken to either love it or hate it. While not as drastically aged like something around the shelf life of 2001: A Space Odyssey, it is fun to pull out the time capsule in anime format for what ideas there were for our not-too-distant future. There are far worse aged things out there, and if you’re looking for a tremendous individual performance, Hoffman’s (three versions of) Lain performance(s) leave a definite hit. Dubs w/ Dil: Your Name.